genealogical materials. We are visited daily by locals, tourists and researchers so funds are needed to keep the Museum up and running. 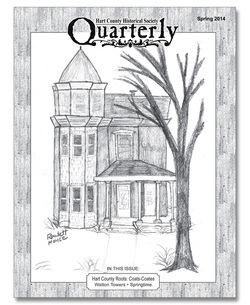 The Society publishes a Quarterly four times per year. This Quarterly contains vital information for historians and genealogists, and features museum news, stories, genealogies, photographs & more. FREE Research - By our staff on a first come, first serve basis. The Hart County Historical Society meets quarterly at the Hart County Historical Museum on the 3rd Tuesday of January, April, July and October at 7 pm Central. Everyone is invited to attend! Quarterly Meetings feature Keynote Speakers, light refreshments and an opportunity for the entire community to come out to the museum for a night of fun.